I found my wheels in the graffiti mural on the Cross Bronx Expressway serviceroad. 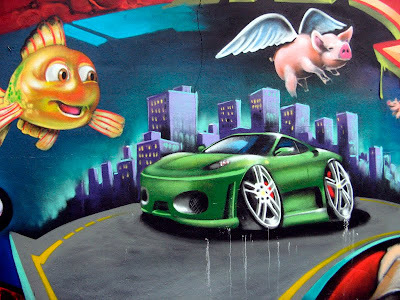 I posted this mural some time ago and came across it in my archives. Hope you like this Gemma! O Mary this is just delightful! Cute and happy wheels! Thank you so much for joining in Wheels Friday! And yes! Those yard art pieces I posted do seem to hint of the mysterious Easter Island statues don't they? But I have also seen some old Middle/South American pieces with hints of this style too! It really makes you wonder just how "connected" ancient worlds may have been!